The Accelerated Mobile Pages is launched by Google, this is a very easy framework to improve web content pages and load quickly on mobile devices. Speed up the load times when pages are accessed on mobile devices. In content delivery network Google gives higher ranking to a publisher who meet the AMP requirements because it improves the overall mobile experience of the web improving. 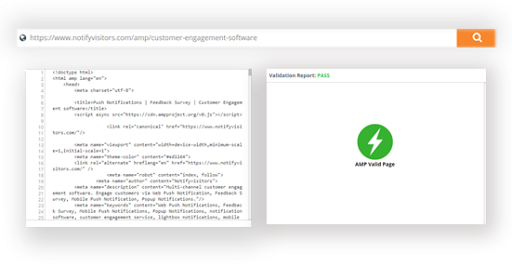 The NotifyVisitors AMP Validator will check your web pages and get the fast report whether your web page is valid AMP or not. If there is any error in AMP pages, this tool will help you to identify errors. How do you check whether your pages are Valid AMP? Here are the top 3 ways to check your web pages are valid or not for AMP. 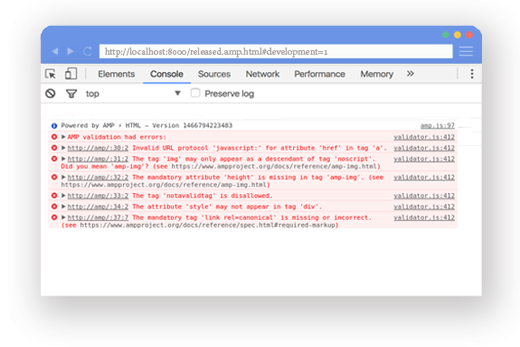 The AMP validator comes bundled with the AMP.js library, so it's available on every AMP page out of the box, simply open the Browser Dev Tools, add "#development=1" to the URL of your page, and reload the page to see validation errors in console if appeared. If you are just trying things out and want to see a live preview try NotifyVisitors AMP Validator. Validate AMP pages and gives a visual indication of the validity of the page as a colored icon, clicking on the icon show you validation result in an overlay. Here's a great service by NotifyVisitors to get you started.